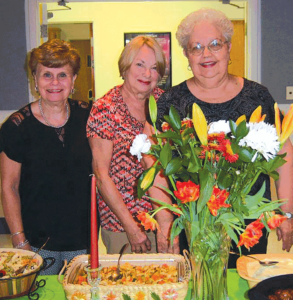 The Matoaca Woman’s Club kickoff their year in which they celebrated the club’s 50th anniversary with a potluck dinner before their first business meeting of 2017-2018 opened. Peggy Perkinson, president, presided over the opening Sept. 19 at New Hope Baptist Church, with members reciting the Pledge of Allegiance and Wilma Norris giving a devotional titled “Jesus Calling.” This was followed by prayer. Hostesses for the evening were Norris, Verta Blake, and Jane Murphy. 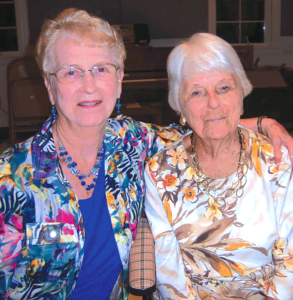 Perkinson announced that it was only fitting to begin this year’s activities by honoring two of the club’s charter members, Ruth Marable and Pat Beville. 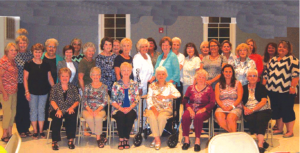 She gave a brief summary of all the positions they held, projects they had done, and contributions that these stout-hearted ladies had made to the organization and community, promoting the club throughout the past and for the years to come. She then proceeded to present gifts to each of these outstanding members for all their achievements – which included a coffee cup and tote bag with the club’s logo, “the Indian Maiden” – in recognition of their continued participation in the organization. Norris, education chairman, delivered school supplies that the members had donated for Matoaca Elementary School. Grace Jones said the members will be selling pecans this year to raise money for the scholarship funds. Club members will also hold a bake sale October 21 at the Vaughan Produce Center in Matoaca from 9a.m. to 1 p.m. The door prize for the evening was a beautiful pair of mums with decorative plant stands donated by Murphy, and a prize won by Kathy Vaughan. A group picture of all attending club members was taken, and Perkinson closed the meeting with prayer.